Sometime in May of last year, I attended a workshop on a new law that was rolling out, related to mandatory organics recycling, hosted by the city of Burbank. Yes, there are workshops out there that talk about the recycling and organics recycling laws we have here in California! While at the meeting, I overheard a woman talking about the health department. As it turned out, she was a project manager for the Los Angeles County Department of Health. I introduced myself, and immediately started telling her about my urban vermicompost business idea. Not only did she introduce me to people within the department to speak with, but also the Los Angeles Food Policy Council. Over the course of the past year, I have attended community events, and participated in various working group meetings, where we have discussed food recovery, food equity, and social justice, among other topics. I have sincerely come to appreciate the diversity they bring to the table, and when I say diversity, I mean in several forms. Council working groups are not only open to, but actually include members of the community, non-profit organizations, municipalities, and private sector businesses. This unique blend of contributors creates synergy that leads to great discussions and collaborations that are both equitable and effective. Additionally, they make a point to do all that they can to create an environment where community members feel like they are welcomed. Their statement of equity (yes, they have one!) touches on several key areas: language, ability, gender, race / ethnicity, class, and inclusive community building. As anyone who works for LA City Sanitation, one of the City’s approved haulers, or any member of the Council, and they will tell you just how integral the Council was at getting the City to include resources for food recovery into the City’s new franchise hauling agreement and zero waste goals. I can’t begin to tell you how much I love this organization! 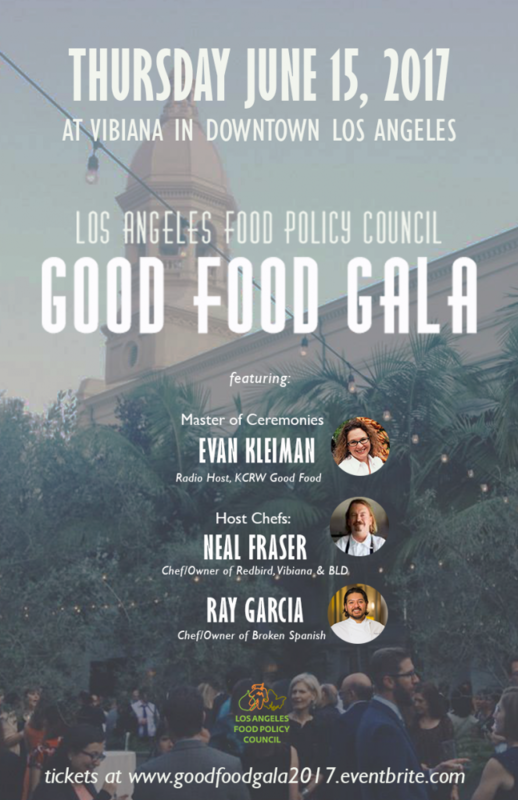 if you are interested in learning more about the LA Food Policy, and are free on Thursday, June 15, 2017, I would love for you to join me at their annual Good Food Gala! This is a ticketed event, so be sure to use promo code “ZeroWasteGuy” for 15%. or, you can click on this link, which will automatically add the code. Well, enough gushing from this guy… I hope to see you there!